A Bangalore-based startup, which helps citizens file queries under the Right-to-Information (RTI) Act, OnlineRTI.com, has revealed in the year since Narendra Modi’s government took charge, there has been a whopping 90 per cent increase in bank frauds, as per Reserve Bank of India (RBI) data obtained through RTI. The data further show that the banks in Maharashtra saw a 150 per cent increase in fraud, from Rs 2,445 crore in 2013-14 to Rs 6,115 crore in 2014-15, and banks in West Bengal notched a 667 per cent increase in fraud, from Rs 773 crore to Rs 5,930 crore. The two states together accounted for more than 50 per cent of the total loss through fraud. 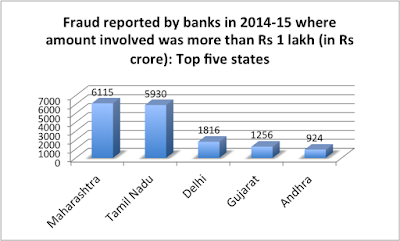 Gujarat, which for long has been touted as India’s “model” state, witnessed a 177 per cent rise in bank fraud – from Rs 453 crore in 2013-14 to Rs 1,256 crore in 2014-15. 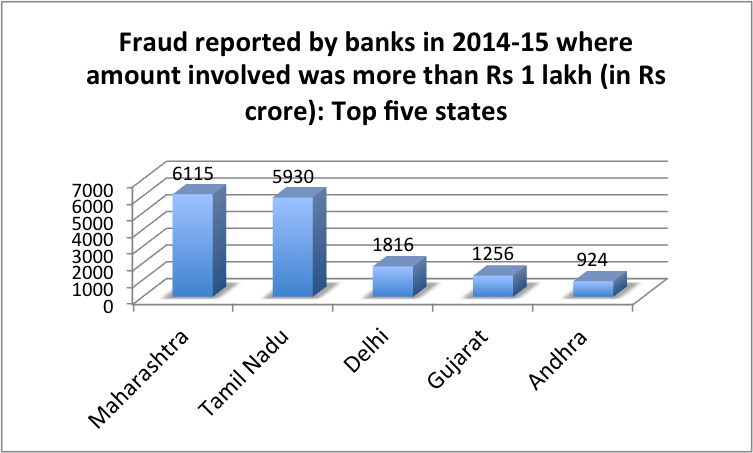 Significantly, in the year 2012-13, Gujarat reported just about Rs 51 crore worth of bank fraud. In Tamil Nadu, it rose by 279 per cent -- from Rs 483 crore to Rs 1,831 crore. During the same period, Delhi saw a fall in bank fraud by 33 per cent and Andhra Pradesh by 26 per cent. Bringing these and other facts to light, an online data analysis website, www.indiaspend.com, said that the rise in bank fraud is a major reason why Reserve Bank of India (RBI) was forced to set up “the fraud registry and the Prime Minister’s Office (PMO) reviewed the fraud-detection system”, says the report. An RBI circular issued in July 2015, taking a serious view of the rise in bank fraud cases, said that when banks discover fraud, they should to report cases to the Central Bureau of Investigation, the police or to the Serious Fraud Investigation Office. 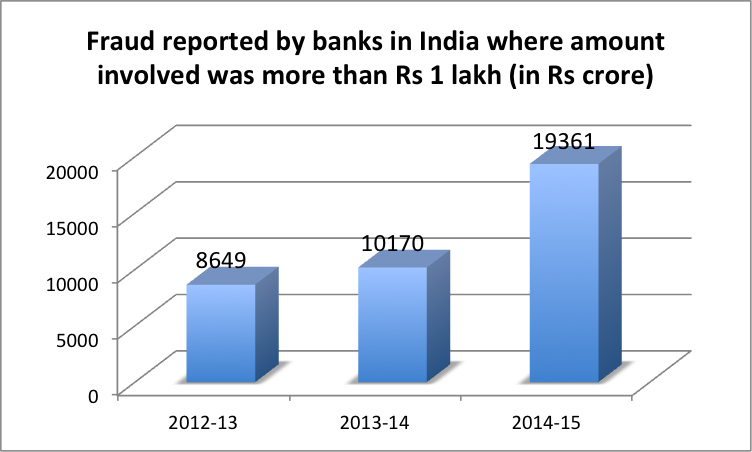 “Public-sector banks appear to have borne the brunt of the fraud-spike, with the Punjab National Bank, which lost a sum of Rs 2,310 crore, topping the list for 2014-15, followed by the Central Bank of India, where the lost amount stands at Rs 2,150 crore, the data further reveal. 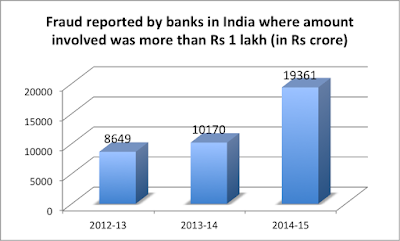 Both banks recorded a fraud increase of more than 200% since 2012-13”, the report, authored by analyst Gangadhar S Patil, said. It added, “Despite a market share of 30 per cent, private banks collectively account for around 40 per cent of losses from bank fraud.” India has 20 private banks, 26 public-sector banks and 30 foreign banks.